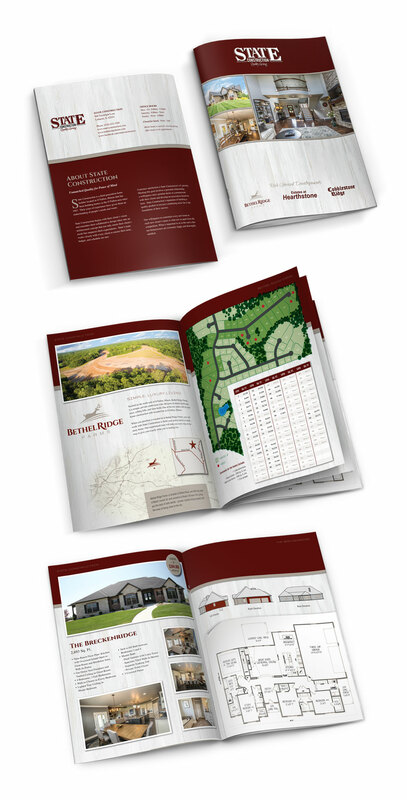 Visual Lure recently completed a new sales brochure for State Construction, a premier St. Louis Metro East residential home builder. They currently have three subdivisions with available lots: Bethel Ridge Farms, The Estates at Hearthstone and Cobblestone Ridge, with more in the works. The subdivisions are all located in O’Fallon, IL, one of the fastest growing communities in the St. Louis area. State Construction has a solid reputation for their commitment to craftsmanship and for building quality homes. It was a pleasure designing a new brochure for them that reflects those same qualities. Not only did we design the brochure, we also gathered print bids, coordinated printing and press checked the project for quality control. Printing was preformed by Schwartzkopf Printing in Alton, Illinois. In addition to the brochure design, Visual Lure is also designing and developing a new website for State. Check back soon for a post on the launch of their new website. Click here to learn more about our graphic design services, or here to view our graphic design portfolio. Please feel free to contact us with any questions about our design services or to receive a FREE quote. 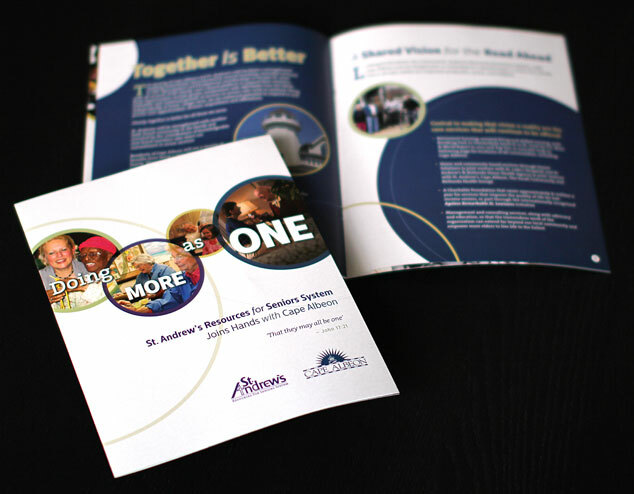 Visual Lure, in collaboration with The Hauser Group, recently completed a new brochure for St. Andrew’s – Resources for Seniors System. The Hauser Group is one of the top public relations firms in St. Louis, MO, and St. Andrew’s is a Missouri-based senior living management company. 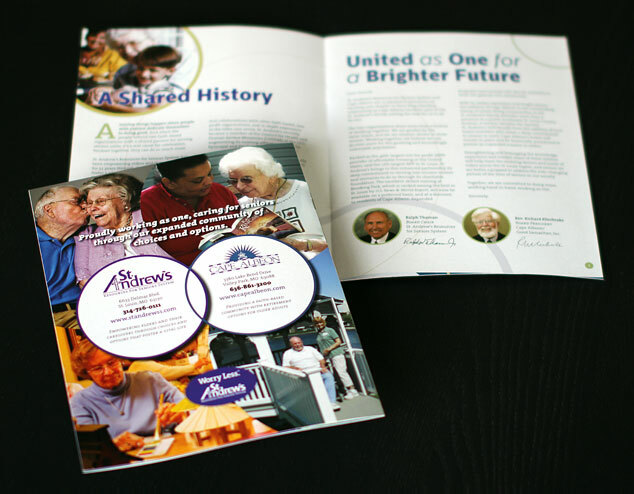 The new brochure showcases the joining of Cape Albeon, a Valley Park, MO faith-based retirement facility, within the St. Andrew’s family of senior living communities. The client really wanted to emphasize the merging of the two companies and requested that we incorporate circles into the design. Below you can see both the front and back cover along with two different inside spreads. Check out our graphic design portfolio, click the following link to learn more about our graphic design services, or contact us today if you are in need of a professionally designed brochure. 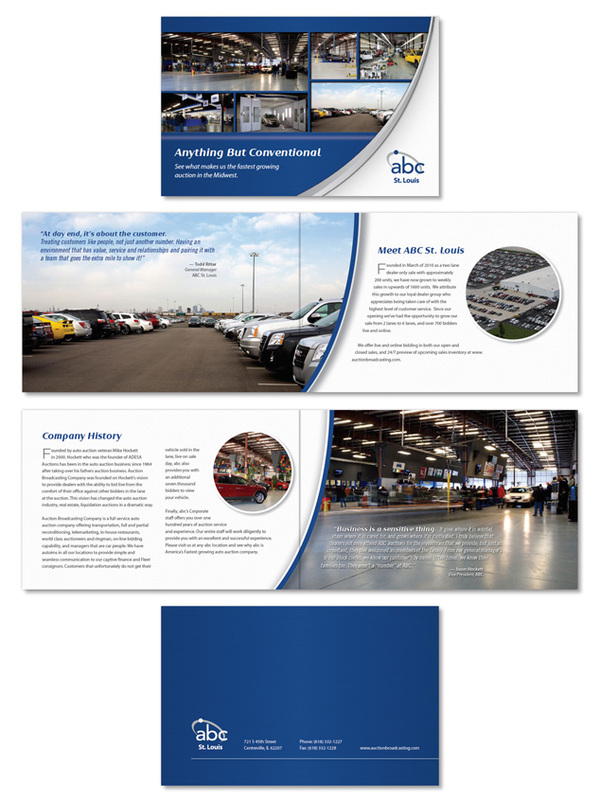 Visual Lure was recently contracted to design a 12 page brochure for ABC (Auction Broadcasting Company) St. Louis, a St. Louis metro east based automobile auctioning company located in Centreville, IL. They are one of the largest auto auctioning companies in the U.S. with locations in Atlanta, GA, Birmingham, AL, Bowling Green, KY, Columbus, GA, Detroit-Toledo, OH, and Orlando, FL. We provided graphic design services and art direction/coordination of a photo shoot.